You may think that all salmon is the same, but each of the five species has its own flavor and nutritional makeup. Sockeye salmon, with its firm flesh and rich flavor, is considered a favorite among salmon eaters. Keta salmon, also called chum or dog salmon, is a drier fillet because of its lower fat content and is one of the lesser-known salmon species. 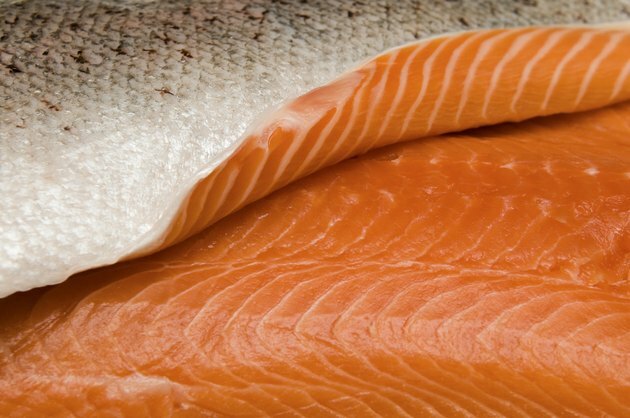 Knowing the nutritional differences between keta and sockeye salmon might help you determine which fish is a better fit for your diet. Utilizing a calorie counter app will provide you with the nutritional breakdown of different types of salmon. If you're counting every calorie, keta salmon may be the fish for you. A 3-ounce portion of raw keta salmon has 102 calories, while the same serving of raw sockeye salmon has 121 calories. Although there's only a 20-calorie difference between the two, every calorie counts when it comes to weight management. Eating as little as an extra 20 calories every day for a year can lead to a 2-pound weight gain. As far as protein goes, there isn't that much of a difference between the two types of salmon -- but the sockeye is a slightly better source. A 3-ounce portion of raw sockeye salmon contains 18 grams of protein, and the same serving of keta salmon contains 17 grams. Most people in the United States do not have a problem meeting their daily protein needs, according to the Centers for Disease Control and Prevention. Adult women need 46 grams of protein a day, and adult men 56 grams. That means one serving of either piece of fish meets 30 percent or more of your daily needs. The American Heart Association recommends that you eat two servings of fatty fish a week for heart health. Fatty fish, like salmon, are rich in omega-3 fatty acids, which are essential fats that keep your heart healthy by lowering triglyceride levels and blood pressure. While both keta and sockeye salmon are both good sources of omega 3s, sockeye beats out keta. A 3-ounce serving of the sockeye salmon contains 1.1 grams of omega-3 fatty acid, while the same serving of keta contains 0.9 grams. But the keta overall is lower in fat than the sockeye, with 3 grams of total fat per 3 ounces versus 5 grams of total fat. When it comes to vitamins and minerals, it's a draw. Sockeye salmon is a better source of vitamin A, but they both contain about the same amount of calcium, iron and vitamin E per serving. A 3-ounce serving of the raw sockeye contains 8 milligrams of calcium, 0.4 milligrams of iron, 164 International Units of vitamin A and 0.8 milligrams of vitamin E. The same-sized serving of keta salmon contains 9 milligrams of calcium, 0.5 milligrams of iron, 84 International Units of vitamin A and 0.9 milligrams of vitamin E.